Just like your choice of language in email and the frequency with which you use emoticons says a lot about you, so does the the format in which you send your attachments. 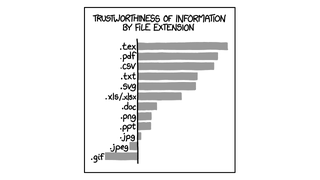 "I have never been lied to by data in a .txt file which has been hand-aligned." Note: This image is a .PNG. Make of that what you will.